Sometimes I feel like I'm stretched a little too thin when it comes to both of my 'jobs.' I'm a full time student, but I consider blogging to be my full time career as well. It can be difficult finding the right balance between the two, especially when I want to put all my effort into both parts of my life. With me writing my undergrad thesis and graduating in May (Terrifying. ), I have a lot that has to get done this year in a little amount of time. Although I'm 99% done with all my requirements (only one more class to go in the Spring!) it definitely doesn't mean that all my work is done. As much as I would love to be one of those seniors that can take a break their last year and give in to the senioritis that is slowly creeping in, it just isn't practical for me to do so....at least not this semester. I've noticed these past few months that I've been a tad bit overwhelmed when it comes to finding time to finish both my schoolwork and my blog work. There are many Sunday and Wednesday nights where I'll stay up much later than I planned while trying to curate great content for y'all, but I know that isn't something that can last forever unless I want to go insane. I mentioned a few months ago about the breakdown I had when I was confronted with school, blogging, and a job. 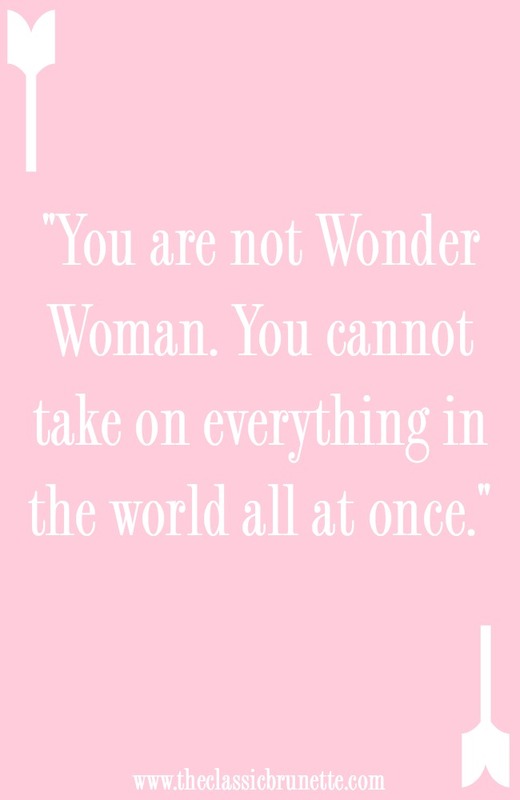 You can read all about the details in my Learning When To Say No post, but what it boils down to is that I learned I am not Wonder Woman, and I cannot take on everything in the world all at once. Even though I am nowhere near as stressed as I was then, I did realize that I had to find a better way to balance blogging and college these past few weeks. I dedicate my mornings and late nights to blogging, and the afternoons to school work. I don't have an actual time on the clock where I designate work, but that's only because my schedule changes daily. But my extra time before heading to school in the morning is always for either taking blog photos, writing posts, or answering emails (although let's be realistic, I'm notorious or checking my email every 15 minutes). And anything I don't finish, besides taking photos, is pushed to right before bedtime. This leaves me the whole rest of the day for my schoolwork. Although I could be a little more strict in my schedule, this has been working out pretty well for me recently! This tip helps me stay organized so that I don't feel bombarded with all my work at once. If I know I have a paper or project in school due soon, I'll at least start it a few days (or weeks if possible) early just so I don't have to worry about it. Staying on top of assignments is key, and if I can slowly dwindle my pile of schoolwork by starting a little early, I'll do it. This way, if the day comes when the assignment is due and I feel a little stressed from blog work, I can be a little more relaxed knowing I don't have the whole project, paper, presentation, etc looming over my shoulder. I feel like this is the most important thing for anything in life. If you don't have support, there's a higher chance you'll give up or fail in whatever you do. I'm happy that the majority of people in my life are supportive of my blog and tell me often about how much they like a certain post or offer to take some photos for me. It may not seem like much, but one little comment really helps brighten my day and makes it so much more worth it to keep this blog going. I have had a few people who've made not so nice comments, but those are in the minority, and for that I'm really thankful. I've found that if you have people around you who will lift you up and encourage both your career and educational pursuits, you want to work harder in both areas. There's always going to be someone getting better grades than you, editing their photos better than you, or coming up with new topics to write about while you're in writer's block. Comparing myself to other bloggers and students is something that I am definitely guilty of doing. It's so difficult at times when you see someone talking about a grade they got on a midterm or how they just reached a certain amount of pageviews on their blog, but playing this game is only detrimental to your success. This is especially true when you're trying to balance two competitive worlds! All you have to do is worry about yourself and do what's right for you. Everyone has different methods of how they work (whether it be in school or on their blog), and what works for one person doesn't mean it's going to work for everybody. Although I do compare myself to others, I try my absolute best not to. If I do, I'll try to do it in beneficial ways like asking someone about their study methods and adapting it to how I study or asking if there was an ecourse for blogging that someone found helpful. It's easy to look at numbers (grades, followers, pageviews, etc), but numbers aren't everything. If you can remember that and focus on your own personal goals, your balance between these worlds will definitely be easier to maintain. Like I stated earlier in this post, it's easy to get overwhelmed with school and blogging. It's okay to say no to opportunities and social events or extra study sessions and just take a moment for yourself. If you take on too much responsibility you can become stressed, tired, and irritable, and no one wants that! Taking breaks is what helps me stay sane.I like to leave my weekends relatively free of school and blog commitments unless totally necessary (like writing my Monday blog posts!). For right now this mostly consists of me doing mini social media detoxes on the weekends. Although I look at social media, I'm not actively thinking about what I need to post and photos I have to take, etc. It's a nice little break from my "work week" but I also don't feel like I'm falling behind on anything either. I think giving yourself a little time to recharge, whether it be one day or a few days, is great for productivity and stress levels! Do you blog and go to school or work full time? Last year, I was so on top of my blog (I had posts scheduled weeks in advance) and on top of my school work. This year is a whole different story. Harder classes, residence life responsibilities, and wanting to produce quality blog content is really hard to balance. I totally agree that having a supportive group of friends is really awesome to have because they push me to get posts out even when I'm frustrated that I don't have anything planned. I've also learned this year to just let things go and not freak out if I miss a post (or a week) here or there. So much yes to this post, Sami. I am in a similar boat to you in that I want to throw myself at my blog, and am sort of doing it, but I am really struggling to show as much dedication to my schoolwork. To me, it's just not as fun or exciting. I could not agree more with knowing when to take a break and designating specific times for specific tasks. Happy November to you and here's to us being college graduates in the spring! I'm not in college, but I have a full time job which makes it soooo hard to blog and work at the same time while not going crazy. Even though I'm not running off to class, these tips are so helpful! It's so important for me to surround myself with like minded and creative folks because it will keep my energy and motivation going. As well, I have to stop comparing myself to other people -- easier said than done but this reminder will help me keep at it. Great job!!! I constantly try and fail to work on assignments early. I just don't get that kick in the but until a day or two before! This post is really great though, I feel like I've been falling apart this semester because of grad school applications and everything else. It's so tough! These are all great truths to hold on to no matter if you are blogging and in school or not! I graduated two years ago, but I still need to remind myself to not compare myself to others and to give myself a break! 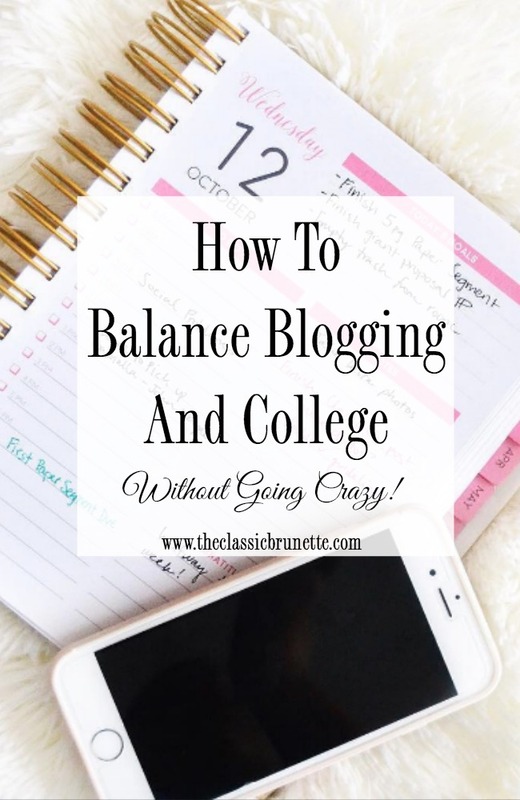 Balancing a blog and school or a job is difficult. I've been on sets for long days this week. In fact I'm on set right now but I have downtime so I'm taking care of some blogging business. It's exhausting but I love doing both. This post is so great! It's nice to know it's not just me that is constantly freaking out about not having a post to upload. We're all in this together. SUCH great tips! I have fallen so behind since starting my MBA - between the blog, finding an internship, having a social life, AND my schoolwork there just aren't enough hours in a day. I graduated in May and definitely agree that it's hard to take on everything all at once. I was feeling really burnt out really quickly between school, my on-campus job at admissions, being an RA, running the blog, applying and interviewing for jobs so going back and forth to the city, planning my sister's wedding, AND maintaining a social life because hellooo #twentyfun! I agree.. you're not wonder woman! Take time for yourself and let life come first! !